Mercedes-Benz has confirmed pricing and equipment for the new S-Class Coupé. Prices for the high-end 7 Series rival will start from £104,115 for the S 560, rising to £128,015 for the Mercedes-AMG S 63 and topping out at £189,615 for the SMG S 65. 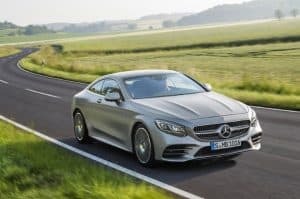 The S 560, which replaces the outgoing S 500, uses a new four-litre biturbo V8 petrol unit capable of producing 462bhp and up to 700Nm of torque. This gives it a 0-62mph sprint of 4.6 seconds with speed electronically capped at 155mph. Driven with a light right foot, it can return 34mpg combined whilst emitting 188g/km of CO2. With 603bhp, the AMG S 63 uses its four-litre twin-turbo petrol engine to blast-off to 62mph in 4.2 seconds, while the 621bhp six-litre S 63 goes a tenth of a second quicker (4.1 seconds). The S 560 may be the entry-level S-Class Coupé but its list of equipment is anything but basic, coming as standard with wireless phone charging, airmatic air suspension, a 12.3-inch dual-bonded widescreen cockpit and infotainment display, Merc’s Magic Vision Control wiper system and Intelligent Light system. There’s also a fixed panoramic sunroof, keyless go, remote boot opening, electrically adjustable seats and steering wheel, 64-colour ambient lighting, ventilated seats, Burmester surround sound system, and 19-inch alloy wheels. S 560 models can be fitted with a Premium equipment line for £4,995 which throws in Nappa leather, 360-degree camera and packages designed to optimise comfort. The S 63 builds on this by adding the AMG sports exhaust system, AMG sports suspension, AMG sports seats finished in Nappa leather, AMG panamericana grille, 20-inch alloy wheels and the Seat Comfort package, which includes massage function. Finally, the Driving Assistance package (£2,580 or £1,695 if specified with Premium equipment line) includes several systems designed to help the driver regarding steering, speed limit, braking, lane keeping and blind spot.